variaDoc allows you to specify the export method, as well as the number and structure of generated documents. This can be useful for automated form filling. To generate a single document for every item in your data source, add a new document, then add the database with the needed data underneath. Finally, add the page you want to work with, using an existing PDF or a new document. The output document is higher up in the tree than the data source. Consequently the data source will repeat the page for each row. All the generated pages are gathered by the output document and combined into a single PDF document. This project structure can be used to prepare a mailing letter that will be printed. 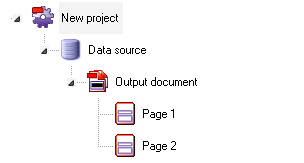 In this project the data source is higher up in the tree than the output document. Now the output document is repeated, similarly to the template page in the previous sample. The effect is that a document is generated for each row in the data source. This project structure is most suited for sending personalized documents via e-mail to as many addresses as you like. variaDoc allows the nesting of data sources to generate almost any conceivable document structure. 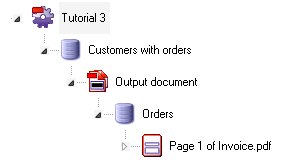 The following structure generates multiple documents. Each document has multiple pages. This project structure can be used to generate multiple reports. You can add multiple template pages to your project by first adding a new database, then a new document, and finally the pages you want to work with(as demonstrated in the figure below). This project will generate multiple documents, each with two pages.